With every Group we require 20% non-refundable deposit of the total amount confirmed. The rest of the 75% are required to be fully paid 1 week prior the arrival date. Changes are accepted and are upon discretion of the Hostel Management whether accepted. The entire amount is non-refundable after the 4th day from the date of check-in. I'M Easy Housing Hostel is our new property Prague, offering wide range of rooms from private to dormitory rooms, all in different formation and size perfect for solo travelers and large Groups. Our property has three floors and on each floor there is a wide and spacious common room so people staying can mingle and have a great time together. 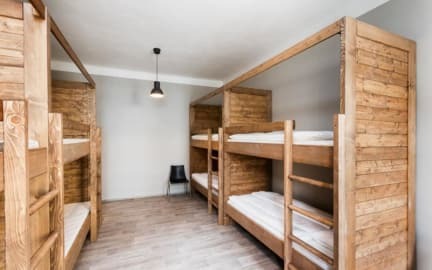 As well we offer great and very comfortable bunk beds often compared to the ones in the Hotels, so everyone can have a great sleep from after having fun and great time at our place. The unique point of our property is the space and comfort combined together but still maintaining the feeling of home and cosiness when everyone is together. 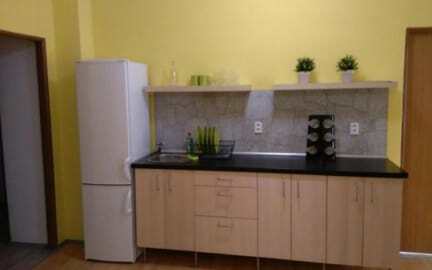 We offer private and dorms rooms all in different size. From 2 bed-rooms all the way up to 8 bed-rooms. On each of the floors you can find a kitchenette as well as a main kitchen for cooking, to use as well other facilities such as a coffee machine, fridge etc. Cancellation policy: 72 hours before arrival day and non-refundable. Meaning: If your arrival day is on the 5th of October you can cancel till the 1st of October till 24:00 o clock. Check in from 3pm to 9pm. Every check-in time between 9pm and 12pm is considered to be a late check in for an additional fee of 5 EUR per person. Latest check-in time is midnight but it must communicated and agreed with hostel stuff beforehand. Check out is until 10:00am. While paying by card 4 % bank commission applies. Towel not included - 2.5 euros per person per stay (upon request). Breakfast can be served for larger Groups at request. Reception is only open from 9am until 9pm. Wir waren mit 36 Leuten im Hostel und für ein spontanes Wochenende war es eine gute Wahl. Der Service ist top, nur gibt es wenige Duschen und es lassen sich nicht alle Toiletten abschließen. Aber es ist sehr sauber und man braucht auch nicht lange in die Innenstadt. Sind mit einer größeren Gruppe angereist. Leider musste ich vor Ort mehr bezahlen, als vereinbart war. Lage ist an sich gut. Kiosk und Haltestelle um die Ecke. Es war alles sehr sauber. Leider krachten mache Betten durch. Die Mitarbeiter haben uns mehr oder weniger in Ruhe gelassen, was gut war. Zimmer sind extrem hellhörig und die Betten haben bei der kleinsten Bewegung gequietscht. Haben die Matratzen dann einfach aufn Boden gepackt, war ja alles sauber.